It has been estimated that there are ~600 cases of Wilson’s disease in the United States and that ~ 1% of the population are carriers. Wilson’s disease may present symptomatically at any age, although the majority presents between ages 5 and 35. The youngest patient reported with cirrhosis due to Wilson’s disease was 3-years-old. Many patients have a combination of symptoms. WD often presents in children as chronic liver disease with abnormal liver tests. Liver pathology ranges widely, from hepatic steatosis to acute and chronic hepatitis to cirrhosis. As WD progresses, many patients develop complications of portal hypertension and liver failure. Acute liver failure (ALF) due to WD develops in about 5% of patients. Patients with WD are more likely to present with neurologic or psychiatric manifestations in their second or third decade of life. Some patients have symptoms of liver disease as well. Neurologic symptoms may be subtle or rapidly progressive, leading to severe disability over weeks to months. The clinical hallmark of Wilson’s disease is the Kayser–Fleischer ring, which is present in 95% of patients with neurologic symptoms and somewhat over half of those without neurologic symptoms. In children presenting with liver disease, Kayser–Fleischer rings are usually absent. 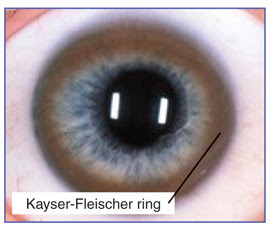 Kayser–Fleischer rings are caused by deposition of copper in Desçemet’s membrane of the cornea.